Monday night I went to the rebroadcast of the 3D version of the Day of the Doctor which is the 50th anniversary special of Dr Who. It was for me, a 40 year long fan of the Doctor, something that was required viewing especially on the big screen. Before I get to the film itself I want to take theater to task for their handling of the screening. Who’s idea was it to run the prescreening material staring at the start time? Normally at Fathom events that stuff runs in the half hour before the show starts, here they ran it at start time which brought groans from the packed theater- more so when they ran it a second time. Thank you Westbury Stadium. The plot of the special has the Doctor (Matt Smith) getting called in by UNIT to help with something at the National Gallery. This leads into the reappearance of an old enemy, and encounters with Queen Elizabeth 1 and two of his earlier selves (David Tennant and John Hurt). I’m not going to go into details of the plot since if you haven’t seen it you’ll want to have the surprises revealed in due time, and if you already have seen it you don’t need me to tell you what happens. For me, a fan of the show before I ever saw an episode (I was hooked based on a write up in Famous Monsters of Film land in the 1970’s) Dr Who is like manna and deeply part of me. I’ve seen pretty much every one of the original run through the Paul McGann movie and a good chunk of the recent series. While I have some of the related merchandise, I’m not overly crazy in picking it up partly because it’s too damn expensive and partly because I don’t feel I need it since I have the stories and such in my head already. What I liked about the special is that while it is concerned with celebrating the 50 year run of the series, it doesn’t go overboard and try and fit in every single Doctor in its story. Yes they are there, but they are not there, they only appear where they should. Mostly the story is just the three doctors at the center of the story. We have a story that takes in the history while driving the current series forward. For me it’s the first time since the series was revived that the new series truly connected with the old series in a way that wasn’t a kind of riff on the old. Here at last the two series have been welded together. There has been some speculation about whether this was intended to be a Christopher Eccelston story instead of John Hurt one. 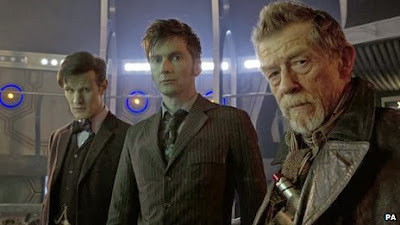 Perhaps it was, John Hurt has said that he was brought into the show right before shooting began, but at the same time the presence of Hurt gives a weight that Eccleston wouldn’t have delivered. We see the lines in Hurt’s face. He see the weight of the world on his shoulders, and if you’ve seen the short with Paul McGann you realize that when McGann becomes Hurt he was youthful, years, perhaps centuries have passed for Hurt and so we know why he feels there is no choice but to destroy the Daleks and Gallifrey. Eccelston, as good as he is could never have shown the pain of centuries of fighting just by being, he is too young, too unbattered. At the screening I attended the appearance of two additional doctors in the flesh and not reused clips met with cheers of delight…and yes the second one is the doctor, the credits list him as such. Day of the Doctor is a great episode.